A Guardian remote control triggers a motor that raises the corresponding garage door. The transmitter functionality of the Guardian remote control can cease to send out the proper code to the motor's receiver due to a weakened battery or being dropped. Reset the Guardian remote control so that it again triggers the receiver connected to the motor. No specialized electrical skills are needed, nor is the warranty of the door opener voided in any way by what you have done. A few items commonly found around the house are all that you will need. Loosen the screw holding the battery compartment lid to the remote's case with a jeweler's Phillips screwdriver. Pull the battery compartment lid off. Remove the nine volt battery and replace it with a new one—lining up the battery contacts of the new battery inside the battery compartment in the same way as that of the old battery. Dispose of the old battery properly. Place the battery compartment lid back on the remote. Screw the screw back in. 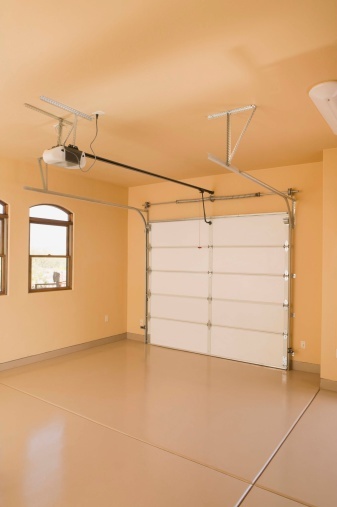 Place a ladder next to the door opener's motor that is attached to the roof of the garage. Climb up the ladder. Locate the "reset" hole on the top of the motor casing. Straighten a paper clip. Insert an end of the paper clip into the "reset" hole. Push the end into the hole and against the contact inside. Hold the paperclip against the contact until a light on the motor's casing begins to blink rapidly. Remove the paperclip. Aim the front of the remote at the motor. Press the remote's button and hold it in. Release the remote's button once the blinking light slows down. Go down the ladder.